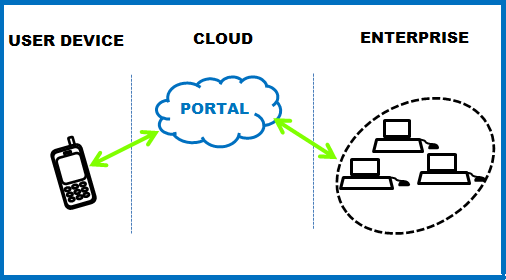 Endpoint – portal – sync server, where endpoint is any client device(mobile, laptop, PC), portal is middle tier which routes the request to appropriate server and sync server is where data resides. Architecture of this product mainly focuses on extendibility and scalability. Use of platform independent technologies ensures that the product can run on Windows as well as Linux systems. In addition, users can use mobile devices to share and synchronize business data, ensuring data availability and consistency. The portal implementation, the REST interface, socket coommunication and even the database integration are coded in Python. 2. The product is a mapping framework for mobile applications. The key feature of this framework is to map user interest with the area/ location (shop, bank, park, building, person etc.) The user provides his areas of interest and the apps, which are built using this framework, guide the user with the options pertaining to that area (i.e. services provided by that area like booking, calling etc.) The product implements the Layar Reality Browser which is a mobile augmented reality application available for Android devices. OAuth 1.0, Google places and Groupon were also implemented. Augmented reality technology allows us to view digital information superimposed onto reality with the aid of cameras, GPS, compasses and accelerometers. With Layar installed on a modern smart phone, anyone can easily discover new information by simply looking around their world. A user could share his area of interest with others by sending a link through email, sms or could share it by posting the link on Twitter. Platforms : Windows, Linux, UNIX, MacOS. Virtualization: VMWare vSphere, ESX, Hyper–V, Xen. Cloud Platforms (IaaS, PaaS) : Azure Cloud, Amazon Cloud, Rackspace, OpenStack, Cloud Foundry. Methodologies: OOA & Design, UML, Requirement Analysis & Gathering using User Stories, Use Cases & Scenario Analysis. Languages, Architectures and Frameworks: Windows – C, C++, C#, .Net Framework/ASP/ASP.net, WCF, WPF, MVC, MVVM architecture, Silverlight, PowerShell, Linux/UNIX – C, C++, scripting languages – shell/bash, Perl, Python Web – PHP, Java Script. Network programming – Client/Server, Web Services/SOAP, Distributed Architectures and Frameworks, Nagios, Open VPN LDAP. BEA tuxedo, Web Sphere MQ. Web Application Frameworks – like Drupal, PHPXampp, Joomla, Liferay. Web UI Technologies: ASP, ASP.net, Ajax, HTML, HTML 5, Ajax, Flex. Databases: MySQL, SQLite, Microsoft SQL Server.